Pneumadyne has been an innovator in the design and manufacture of hydraulic and pneumatic manifolds since 1976. We offer a wide selection of styles and sizes to ensure that your plumbing and installation requirements are met. 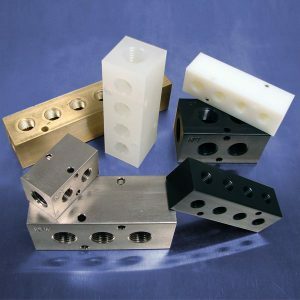 Two to 10-station aluminum, brass, stainless steel, polypropylene and nylon pneumatic manifolds are available, with port sizes ranging from 10-32 (F) to ¾ NPT (F). To accommodate the installation of larger pneumatic control valves or fittings, aluminum air manifolds with 1.5” center-to-center output port spacing are available. For plumbing convenience, our aluminum valve manifolds are available with output ports at 90°. Standard and 1.5” center-to-center output spacing provide added versatility for the installation of larger fittings or valves. Pneumadyne’s dual air manifolds feature two separate pneumatic manifolds in one block, allowing two independent flow paths (i.e. pressure on one side, vacuum on the other) to be plumbed at the same location. Terminal distribution blocks offer a tee configuration and are available with 10-32 (F), 1/8 NPT (F) and ¼ NPT (F) thread sizes. Junction blocks feature a union configuration. Four, six, eight, and 10-station blocks are available with 10-32 (F), 1/8 NPT (F) and ¼ NPT (F) ports.